Ralf Jungmann is interested in processes that take place within unbelievably tiny spatial dimensions. Jungmann holds a professorship in experimental physics at Ludwig-Maximilians-Universitaet (LMU) in Munich, and heads a research group in molecular imaging and bionanotechnology at the Max Planck Institute for Biochemistry (Martinsried), and focuses on extending the capabilities of optical microscopy. His goal is to visualize the molecular interactions that take place within individual cells. In order to monitor the protein networks involved in such processes, he uses short DNA strands covalently attached to various fluorescence markers as probes to locate target proteins bearing complementary DNA tags. By exploiting the sequence specificity and versatility of DNA hybridization, it is possible to image the distributions of large numbers of molecules in single cells at super-resolution. The combination of DNA sequences with different fluorescent compounds explains why the technique bears the name DNA-PAINT. 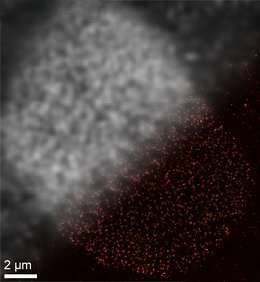 One of the major restrictions on the potential of super-resolution fluorescence microscopy has to do with the markers employed to detect targets of biological interest—they are simply too big. "We are working with an instrumental resolution of less than 10 nanometers. But the fluorescent labels conventionally used to tag proteins are much bigger than that. And this factor has hampered the progress of this whole field of research," Jungmann explains. This is what motivated the work described in a new study, which appears in the journal Nature Methods. In this paper, Jungmann and his colleagues explore the use of what are called SOMAmers, a special class of DNA aptamers, as a means of downsizing the markers used in DNA-PAINT. The term 'aptamer' was originally coined to refer to single-stranded RNA molecules that fold into defined three-dimensional shapes and are able to specifically detect unique protein species. Jungmann's aptamers are single-stranded DNA molecules, which fold into defined three-dimensional shapes that can bind directly to specifically targeted proteins. "The ideal label used to tag proteins efficiently and specifically must fulfill several criteria," says Sebastian Strauss, a member of Jungmann's group and first author of the new study. "It should be as small as possible, and it should bind to targets stoichiometrically to enable precise quantitation. In addition, it would be ideal to synthesize whole libraries of these compounds and rapidly identify suitable markers for the proteins of interest. In order to assess the potential of DNA aptamers, the LMU team collaborated with the American firm SomaLogic, which had already designed, for other purposes, a huge array of modified aptamers (SOMAmers) that can specifically bind thousands of different proteins. In the new study, the Munich researchers modified a selection of these aptamers for DNA-PAINT and developed efficient labeling protocols for fixed and life cells. The current study shows that it is indeed possible to improve on the resolution attainable with conventional fluorescence labels using these novel labeling reagents in combination with DNA-PAINT super-resolution microscopy. "We expect that the new method will provide a significant boost for super-resolution microscopy, particularly with respect to its range of application in biology," says Ralf Jungmann. His goal is to use DNA-PAINT to simultaneously visualize and monitor as many proteins and their interactions as possible. In future experiments he and his colleagues plan to use the new labelling method to image whole protein networks at high resolution. "We will be able to address biological and biomedical questions that have thus far been experimentally inaccessible."